Up at 5 AM for a busy day, I dressed in my new Sofia Vergara outfit and drove to Diana (of Diana’s Little Corner in the Nutmeg State fame) to carpool to the True Colors Conference at UCONN. The forecast was for a pleasant day… sunny and temperatures around 50 degrees. I figured my new trench coat would be adequate, however, when we arrived at UCONN, it was more like Yukon. The wind was blowing hard and I can’t recall ever feeling so cold walking the quarter-mile from the parking lot to the Student Union. My guess is that the wind chill was well below freezing. 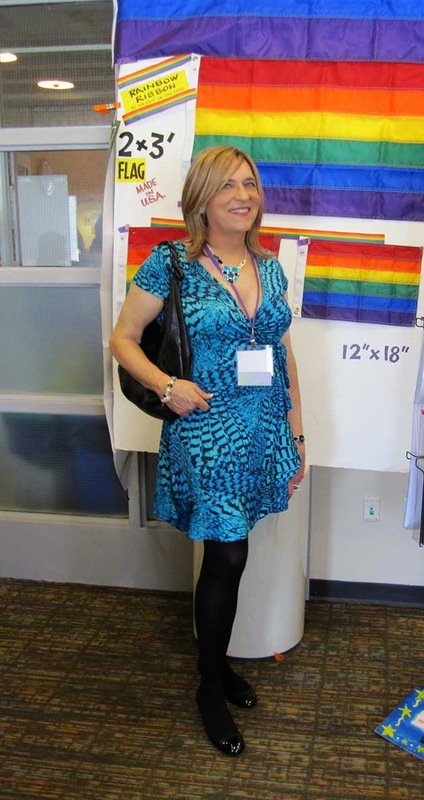 I checked in, got my presentation package and spent most of the day hanging around my old support group’s table, which was staffed by a very able crew of transwomen including my old Fantasia Fair pal, Karen Marie, who is magical in the way she is able to interact with the adults and kids, who stopped at our table. I encountered a lot of old friends and sadly, I missed a few who I know were there but who did not appear to me in the crowd of nearly 4,000 attendees. I also made some new friends, like Susan Collins and Lorelei Erisis, so I guess I am “even Steven” as fast as missing old friends and making new ones! As I mentioned here on Thursday, I changed the name of my presentation from a title that mentioned “femulate” to something that mentioned “crossdressing” figuring that the latter would garner a larger audience than the former because all the attendees knew what the latter meant, but not so much the former. My strategy paid off. I did not do an exact headcount, but I estimate that there were nearly 40 people in attendance, which is by far an all-time high for my True Colors Conference presentations. By the way, there were three or four adults in the group and the rest were middle school, high school and college students. My presentation, Crossdressing Successfully in the Real World, went well. There were a lot of good questions and exchanges throughout my presentation and most of the post-presentation evaluations rated me Above Average or Excellent. I hope I helped someone. I noticed a few people taking notes, so some people must have taking away some useful information. Diana and I left Yukon about 5 and ate dinner at an old mill that was converted into a restaurant (Adam’s Mill Restaurant in Manchester). There were no issues - the staff treated us transwomen like ladies and when we left the restaurant, a middle-aged gent (a customer, not an employee) held the door open for us. I was home around sundown and my big takeaway from True Colors this year was how great it was to see so many of the students en femme. When I started attending True Colors back in 2007, few if any of the students presented en femme. Actually, I don’t recall any presenting en femme, but I did not see everyone, so I might have missed someone. Fast-forward 7 years and there were students everywhere presenting en femme, which warned my heart and put a big smile on my face. 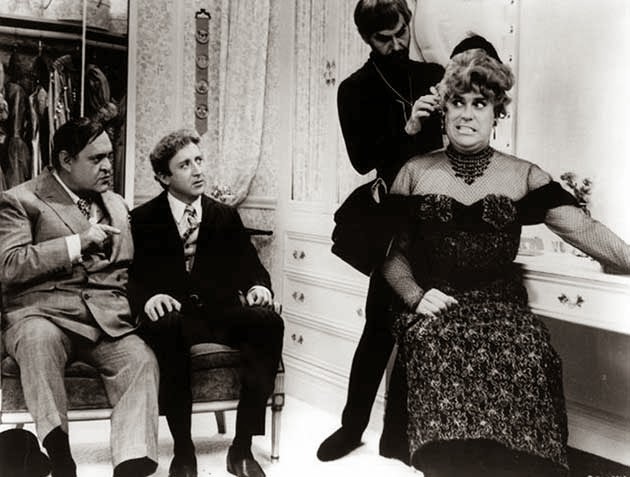 Actor Christopher Hewett (right) femulating in the 1967 film The Producers. I just wanted to say.... you look beautiful in that dress....and have a great day! You really should find a shot of Hewett in his "Chrysler Building" dress from the same film...."
I don't believe Christopher Hewett wore a Chrysler Building dress in that film. However, in Tuesday's post, I have a photo of Gary Beach wearing a Chrysler Building dress in the 2005 remake of that film. 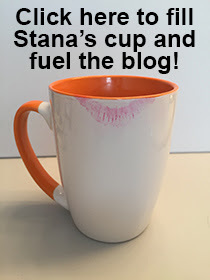 As always Stana thank you for representing and presenting we femulators in a positive light! I have no doubt your ability to present our case has given inspiration and guidance to many. Not but a few years ago when I was still on the road, I'd often femulate dine at the Adams mill, all my experiences there were wonderful, the food and service was always it should be for a lady. There was another wonderful restaurant always dined at when in Milford. Armellino's. Got on great with the barmaid there.